You will never tire of chicken dinners when you care cooking meals like Moroccan chicken with almonds, apricots, and cauliflower couscous. 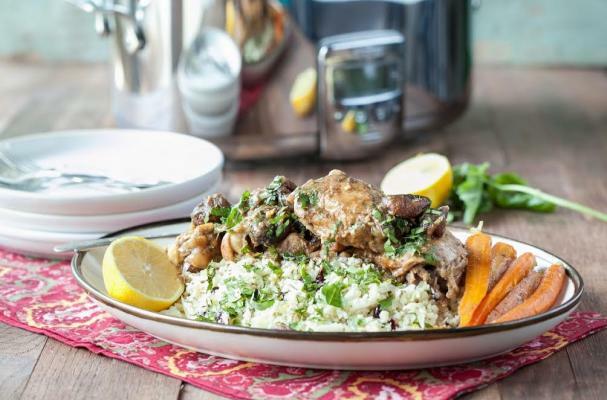 This simple and straightforward meal is prepared mostly in the slow cooker with the exception of the couscous. The chicken is seasoned with a variety of warm spices including ginger, cumin, coriander and cinnamon. The dried apricots provide a sweet contrast while the almonds add crunch. Cauliflower couscous is the perfect vehicle for soaking up the wonderful sauce. Step 1: Heat olive oil in a large pot over medium-high heat. Season the chicken generously with salt and pepper then add half of the chicken to the pot. Cook for 5 minutes, browning on all sides. Transfer the chicken to a slow cooker and repeat with remaining chicken. Step 2: Return the pot to the stove and add onion and garlic and sauté for three minutes or until tender. Add the ginger, cumin, coriander, cinnamon, cayenne, salt and pepper and sauté for 30 seconds or until fragrant. Step 3: Stir in chicken stock and almond butter, scraping pot to loosen any browned bits. Pour contents of pot over chicken into the slow cooker. Cover and cook on low for five hours. Step 4: Add the apricots and baby carrots to the slow cooker, cover and cook an additional hour. Step 5: Meanwhile, prepare the cauliflower couscous. Rice cauliflower by running the florets through a food processor with a grating attachment or use a box grater to create rice-like pieces. Pick out any large fragments that didn’t get shredded and save for another use. Heat olive oil in a skillet over medium heat. Sauté the onions and garlic for 2 minutes, then add the cauliflower, salt and pepper. Sauté for 8 to 10 minutes, until the cauliflower is tender. Stir in the cherries, basil, cilantro and lemon zest. Step 6: Garnish the chicken with toasted, sliced almonds and fresh cilantro. Serve over cauliflower couscous.